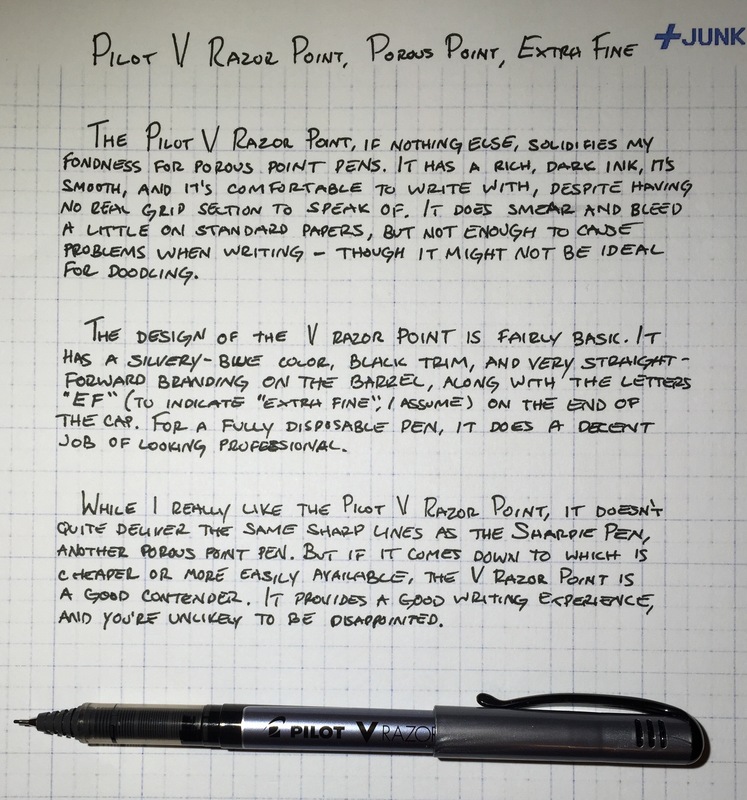 The Pilot V Razor Point, if nothing else, solidifies my fondness for porous point pens. 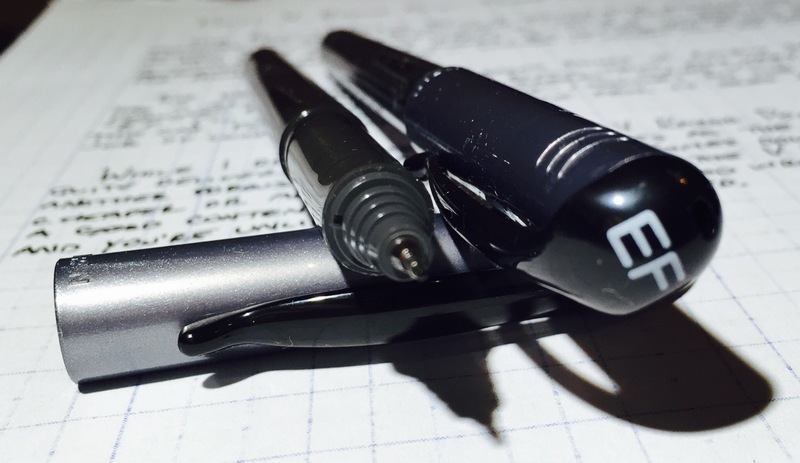 It has a rich, dark ink, it’s smooth, and it’s comfortable to write with, despite having no real grip section to speak of. It does smear and bleed a little on standard papers, but not enough to cause problems when writing – though it might not be ideal for doodling. The design of the V Razor Point is fairly basic. It has a silvery-blue color, black trim, and very straight-forward branding on the barrel, along with the letters “EF” (to indicate “extra fine”) on the end of the cap. For a fully disposable pen, it does a decent job of looking professional. While I really do like the Pilot V Razor Point, it doesn’t quite deliver the same sharp lines as the Sharpie Pen, another porous point pen. But if it comes down to which is cheaper or more easily available, the V Razor Point is a good contender. It provides a good writing experience, and you’re unlikely to be disappointed. Review at Office Supply Geek. He liked the pens overall, but didn’t like the “EF” on the cap. A multitude of colors are also shown off in this review. The guys at PenSwag, on the other hand, liked the “EF” on the cap. They also liked it better than the Sharpie Pen. PenReviewsToday has a video review. He liked it over all, and didn’t see any problems with bleeding.